SCHOOLS in the County Down area are being encouraged to enter Action Cancer’s Health Action Awards, which are sponsored by retail group Centra. Open to all schools in Northern Ireland, the awards take place on June 3 at the Odyssey Arena, Belfast, and recognise healthy schools across Northern Ireland. Schools, nurseries and colleges can enter, whether they provide healthy meal options in their cafeteria, promote extra fruit and water in school, are involved in extra-curricular exercise programmes, or run cancer awareness initiatives. 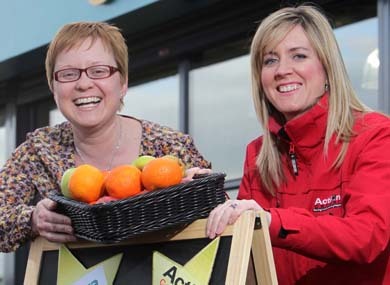 Lucy McCusker, Action Cancer Events Officer and Nikki McDowell, Centra Brand manager, atr the launch of the Health Action awards. There are Gold, Silver and Bronze Awards for nursery, primary and secondary schools. A prize of £200 is also up for grabs, for purchasing school equipment, and will be awarded to the highest scoring pre-school or nursery, as well as each of the top scoring primary schools, secondary schools or colleges in each of the five Education and Library Boards. Schools, nurseries and colleges can get entry forms by contacting Action Cancer on 028 9080 3344 or online atwww.actioncancer.org Completed Health Action Award forms must be returned to Action Cancer by 28th March 2014 and successful schools will be notified at the end of April 2014.